We did it again- we hosted the second edition of our breakfast event to discuss the topics of: open technology, data lakes, and cloud storage security. There has been a lot of buzz around what exactly a data lake entails, especially in comparison to data warehouses. We wanted to clear the air and define what a data lake is in our own words; in addition: we revealed our platform’s secret sauce! We held the event right across the street from the CN tower at the Amazon Toronto offices where many big name financial institutions were in attendance such as: TMX, Scotiabank, Canada Pension Plan, Cloudera, amongst others. Our speakers included: Jennifer Reynolds, CEO from the Toronto Financial Services Alliance, Francis Wenzel TickSmith CEO, Dora Lee, Associate Director of Global Equity Derivatives from National Bank of Canada, and Nav Anand, Partner Solution Architect from AWS. The event started out with Francis Wenzel pulling out a floppy disk and asking the crowd if they knew what it was. He was half joking because many financial institutions are still shipping their data on hard disks. Francis went on to explain that our TickVault platform is completely based on open technology which makes it easier for both partners and clients to integrate and build solutions for various use cases. Francis also highlighted that the TickVault platform is more of a data lake than a warehouse. The main difference between the two is that a warehouse can simply retrieve structured data whereas a data lake copes with both quantity and diversity of structured/unstructured data from various sources. 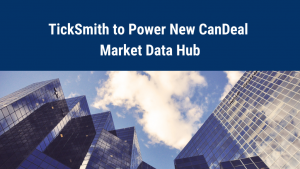 Recently, CME Group’s DataMine (which is powered by TickVault) made Third Party data correlated to CME Group Markets available. The third party data includes: TellusLabs datasets which provides satellite-based scores of plant conditions and progress designed to help commodities researchers understand the status of a given crop. This client use case validates that the TickVault platform is able to handle more than just tick history; it can also manage and normalize alternative data. But what everyone really wanted to know is what is our secret sauce? The answer was rather simple. Our platform is completely modular which makes it easy to adapt, quick to implement, and cost effective. TickVault’s modules makes it possible to fit your current and future needs. You can also work with your in-house developers to build add-ons on top of the TickSmith solution. Francis continued highlighting that our platform can be deployed on premise, on cloud, or both. He also accentuated that our platform is optimized for AWS and that multiple clients use our solution and AWS for cloud storage as they feel it is the most secure and cost effective. Some of those clients include CME Group and National Bank of Canada. Dora Lee started off her presentation by jumping into what exactly are the challenges she faces as a data scientist at the sixth largest commercial bank in Canada. She showed the crowd a slide that described how data used to be managed (when it was manageable). However, as we are living in a data-driven society and data is growing, especially in the financial sector, new ways of scaling data are necessary. Dora mentioned that without a concise data management solution, her value-add content and predictive analysis would not be as accurate or compelling. Dora continued by saying that two years ago, National Bank started looking for a solution that could help them scale their data. They chose TickVault based on: the quick time-to-market, cost-effectiveness, and customizable modules. She said that once National Bank implemented TickVault’s Book Replay, which is a point-and-click market-depth consolidation, they were able to reduce their effort from weeks to minutes! This meant that more analysis could be made on the data and essentially, the bank could bring in more revenue. Dora finished off her presentation by stressing that as an analyst, she consistently needs to be at the forefront of the market. She compared it to being an F1 driver saying that analysts need situational awareness; they need to be able to see, hear, and smell where the market is headed next. What fuels all of those predictions and projections? Data. Moreover, data that is well-managed, easily accessible, and secure. National Bank of Canada have been able to achieve this level of excellence since implementing TickVault two years ago. They chose to run everything on AWS as it was straightforward in terms of deployment, and offers various services. AWS also supports Cloudera, which they selected for their Hadoop distribution. Nav Anand brought his energy to the front of the stage to make it super clear that AWS Amazon is a secure place to store data. He stressed that cloud security at AWS is their highest priority. He said that firms benefit from a data center and network architecture built to meet the requirements of the most data-sensitive organizations such as banks, hedge funds, etc. He pointed out the advantages of working with AWS; he said it allows its users to scale and innovate, while maintaining a secure environment. Users only pay for the services they use, meaning they can have the security they need without the upfront expenses and at a lower cost than in an on-premises environment. For this reason, TickSmith always highly recommends AWS to users who are looking to cut costs while also remaining innovative. As a testament to AWS security, National Bank of Canada have been using them for over two years and have never had a breach. We were excited to host this event alongside our client, National Bank and technology partner, AWS. We are eager to see how our data lake platform can be integrated within your infrastructure and how it can help you make shared data the center of their architecture.